AccuMark™ DNA Ladders are available in four different formulations to provide you with maximum versatility. Our selection of DNA markers range in fragment size from 100 base pairs to >23 kb for a variety of electrophoretic applications. All AccuMark™ DNA Ladders are supplied in 250 µg solution at 0.2 mg/ml concentration. 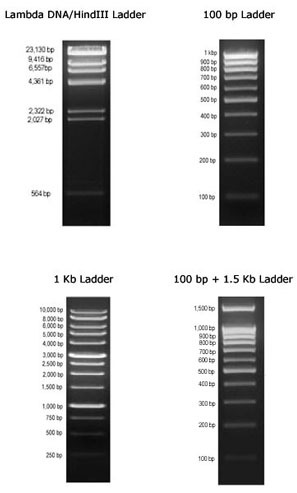 For maximum stability and long-term use store DNA ladders at -20ºC upon receipt. Storage buffer: 10 mM Tris-HCl (pH 8.0) and 1.0 mM EDTA. The AccuMark™ DNA ladders are stable for 6 months when stored properly.